What color can a dog see? If a dog is color-blind, it should only be seen in gray, and other colors can't be seen, but recently foreign scientists have studied the topic of what colors dogs can see, knowing that dogs It is not our so-called color blindness, because it can also see other colors, for you to understand what color the dog can see, let you know more about its habits. After the dog was raised, everyone said that the dog is color-blind. In their world, there are only a few single colors. We use scientific evidence to prove that dogs are not simply color blind. The British Daily Mail reported that there has been a widespread misconception among dogs that dogs can only recognize monochrome and use different brightness to identify the appearance of the item. However, Russian scientists have now proved that dogs not only have a limited range of colors, but also use this visual spectrum to distinguish different objects and select a specific one from them. Prior to this, dog trainers avoided the use of objects of different colors when training pets to perform specific tasks, but this study has found that it can improve the way animals are trained and what they can learn. 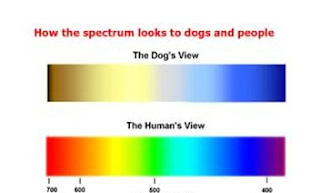 The spectrum that dogs and humans can see. A scientific team of the Dieter Sensory Processing Laboratory of the Russian Academy of Sciences tested the vision of eight dogs of different sizes and breeds. They hope to expand the research conducted by the University of Washington last year. Jay Neitz, an American university scientist, conducted experiments on dogs to test if they could see the colors. He found that the human eye has three cones that monitor color and can identify red, blue, green, and yellow light, whereas dogs have only two cones. This means that dogs can distinguish between blue and yellow but cannot distinguish between red and green. The human eye can see the spectrum. So Russian scientists printed four colored papers with different colors: dark yellow, dark blue, light yellow, and light blue. Dark tone and light tone are theories for detecting how a dog distinguishes objects by their brightness. In the first test, the researchers held a combination of dark yellow and light blue and dark blue and light yellow paper and placed it in a food bowl in a closed box. Then open one of the boxes and place the dark yellow paper in front of the box containing a piece of meat. Each time the test dog tries to open one of the boxes. The spectrum that the dog can see. The dog did three experiments and remembered which colored paper was in front of the box containing the meat. Once the dog can identify the dark yellow paper, which means that the food is nearby, the researchers want to determine whether the animal chooses this paper because of the brightness of the color. Therefore, researchers put dark blue paper in front of a box, and dark yellow paper in front of another box. If the dog chooses a dark blue paper, the scientist can determine that the animal makes a choice based on the brightness of the color. However, if it chooses pale yellow paper, it means that their choice is based on different colors. In the test, the dog must learn that the dark yellow paper is always placed in front of the flesh box. About 70% of the time, each dog chose pale yellow paper - which means that their choice is based on color. Six of the eight dogs selected pale yellow paper for approximately 90% to 100% of the time. The researchers concluded, "We have shown that for eight dogs that have never been trained before, the color, rather than the brightness, is more informative in the selection of visual stimuli with different brightness and chromaticity, although in our experiments, The dog may use brightness to distinguish different stimulants, but it does not." "Our results demonstrate that even in animals with only two spectral types of cone photoreceptors, color information is still dominant under natural and bright light conditions."